I’ve also included a tasks directory in the .zip. In here our 2 new tasks, drop these 2 in lib/tasks. One is called test_helpers.rake, which adds a rake task to run all your helper tests like so rake test:helpers. The other is redefining the default rake task test to run your units, functionals, helpers, then integration tests – basically the same as before but also includes your helper tests. You can run an individual helper test or an individual helper test method the same way you can w/ unit and functional tests, e.g. 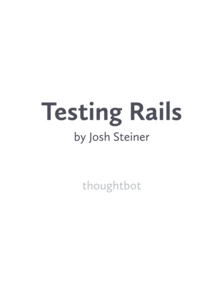 All helper tests are put in RAILS_ROOT/test/helper. i.e. no underscores on the instance variables. As for writing your helper test methods, anything that’s available normally in a helper (#link_to, #h, etc.) is available in the helper test as well due to the various ActionView modules being included in. Enjoy.